Volume 13 of The Chronicles of Canada Series. This volume sheds light on the often misunderstood Americans who chose to remain loyal to the Crown of England during and after the American Revolution. While the vast majority of American writings which detail the Revolution paint the Loyalists (sometimes called Tories) in the most negative fashion, this volume explains the reasons behind their election to flee to Canada (and other countries) rather than remain on American soil. While no exact numbers exist of Loyalists who fled to Canada in 1783-1784, the estimates of John Adams and others of the time period range in the vicinity of one third of the population, which places that number at about a million. These were not people who fled in fear, rather they were generally people who felt the benefit of support from the British Crown outweighed the support they would receive from the unproven social, financial, and political structures which had yet to be formed. Some were opportunists in search of free land. But all were a brave people who chose to leave the comfort of their homeland to help settle uncharted territories of what we now know as Quebec, Ontario, New Brunswick, Prince Edward Island and Nova Scotia; a people who held their heads high as they settled a largely untamed land. Other than the racism! 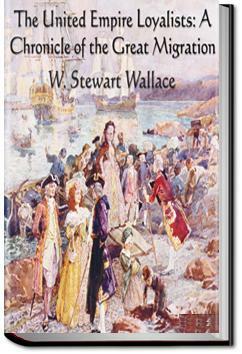 this book is good for a basic overview of what produced the Loyalists. I like the way it is divided into regions where they settled so that I can focus on the area pertinent to the family.